Most Georgia pecan growers with newly planted trees suffered at least some damage from ambrosia beetles last year. I don’t know if this year will be as bad, since we hadn’t seen that level of beetle activity since the ‘90s and we don’t know why the beetles showed up in such numbers all across the southeast. But I do know there are plenty of growers asking what to do to avoid the problems of last season. I wish I could say there is some preventative action growers could take to head the beetles off, but there is no such option. Years of hard work and considerable expense by the ornamental tree nurseries demonstrated that pretty conclusively. There are some things growers can do to limit losses, though. The first is trapping for adult beetles to pinpoint when the first flight starts. This has been highly variable in past studies, ranging from late January to mid-March in south GA (the Fort Valley area is generally a week or so later). We never found any way to predict the date, so we settled on beginning trapping by 1 Feb as the best plan. You may miss the first day some years, but not often and usually the real flight is after Feb 1st. There are several traps that work (google “ambrosia beetle traps”), but the simplest and most efficient is made from a bolt of wood with a hole drilled down the center. Any hardwood will work, and a branch 2” – 4” in diameter, about 2 feet long will do the trick. Drill a ½” (+/-) diameter hole down the center as far as you can (but not all the way through) and fill it with ethanol (grain alcohol, not rubbing alcohol; denatured is OK). Put a stopper of some sort (a cork, for instance) in the hole and then hang the bolt about waist high at the edge of the orchard. It will probably take several traps per edge, but edges along woodlines are most likely to catch beetles first. Once attacks are detected on the trap, close-interval scouting can be initiated (check the trees every day or so for signs of beetles). 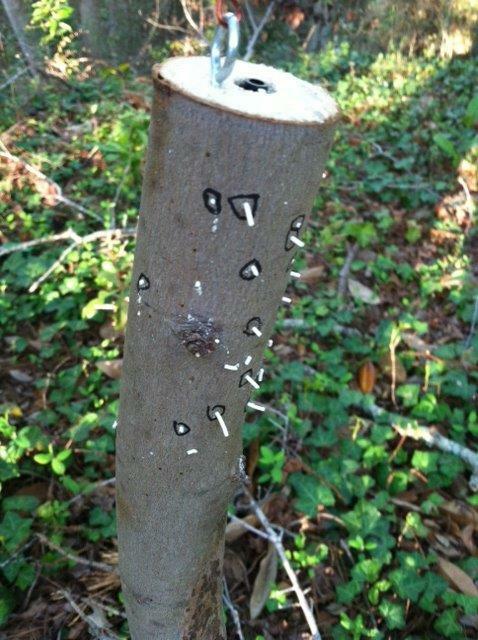 If you see toothpicks on the trees, apply a pyrethroid spray quickly to minimize damage and losses. Unfortunately, barrier sprays applied as a preventative measure for other borers are not effective on these beetles. They will provide protection for a few days or a week, depending on the weather, but ambrosia beetles do not eat the wood or bark so once the volatility of the insecticide has faded a bit they are not affected. 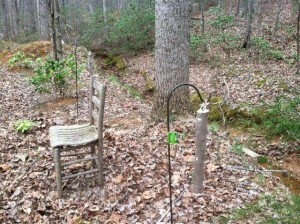 Another thing that will reduce losses is removing the irrigation pipe collars that protect young trees from herbicides. Ambrosia beetles will attack inside the pipes where they can’t be seen easily, as many growers found out last year. That adds work, and means you have to delay herbicide application until they can be reinstalled after the trees leaf out completely and get growing in the spring, but the collars definitely contributed to extra losses for a number of growers. The spring green-up period is when the trees are most vulnerable, and once they have leafed out completely the risk of attack drops to almost zero unless there is some stress factor for the trees. Which brings us to the most important factor. 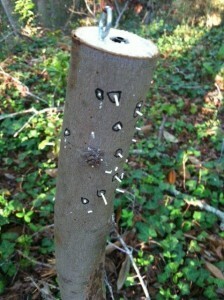 Ambrosia beetles are active all year long, and they are strongly attracted to stressed, diseased or injured trees. Growers should be very alert to any problems with irrigation, especially during hot dry weather. Keep tractors and other equipment well away from the trees to avoid injury that invites ambrosia beetles and other borers. Photos courtesy of Dr. Pete Schultz, VPI&SU.